I put that 'Sgraffito' in quotations for a reason: I didn't glaze this tile and then scratch through the surface like real Sgraffito. I love Old School, but who wants to work that hard these days? My finished tiles will be applied to an exterior wall. I made the prototype tile out of plaster, then cast it in concrete and simply painted the raised relief. If the client goes for the sample tile I showed them (above) then I'll make two hundred more from a rubber mold. Way easier than real Sgraffito. 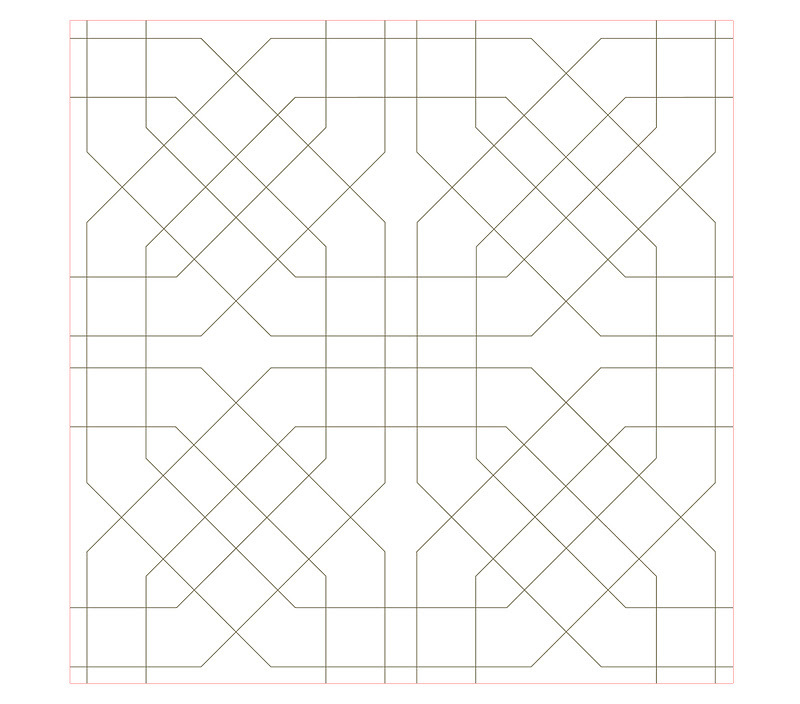 This post was going to be a whole big stink about Islamic Geometric ornament, the Alhambra, 3-D Rapid Prototyping etc. etc., but I'm going to have to get to that later. In the meantime, artist Mark Kusek turned me on to this incredible website for an enormous stack of free Islamic pattern drawings which made me realize that the topic is already well covered. Thanks, Mark! "Taqshir, or 'peeled work,' in which glaze is scraped off negative areas of the mother tile to leave behind a shiny pattern in low relief" (Louis Werner). Taqshir is most often used on black glaze with the exposed terracotta base of the tile being allowed to weather naturally, contrasting with the glaze even more beautifully as time goes by. 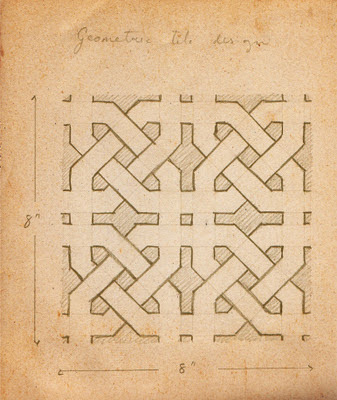 In Spain, the same technique is called Esgrafiado, and commonly incorporates geometric designs. No doubt the Moorish influence spreading North. In Italy it's Sgraffito, but you knew that already because you Googled it and that's how you found me. The photo above is staggeringly beautiful in it's complexity, but don't let it deter you: With simple vector drawings (or even regular digital photographs) there are companies out there who will take your 2-D artwork and produce 3-D glazed ceramic tiles using computer technology. 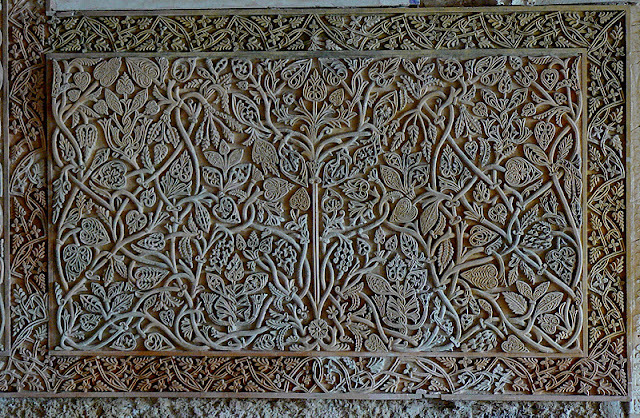 In other words, your simple black-and-white ornament drawing could be used to manufacture the panel above. 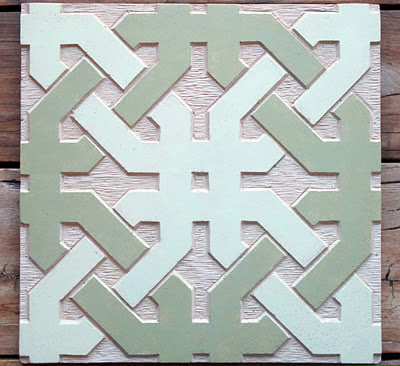 Photo-Form® is a company that can translate two-dimensional artwork into three-dimensional relief tiles. "Utilizing [their] patented process called Photo-Cast®, [they] can create bas-relief tiles from any type of two dimensional image." (source) They can even cast using concrete or glass. Awesome! 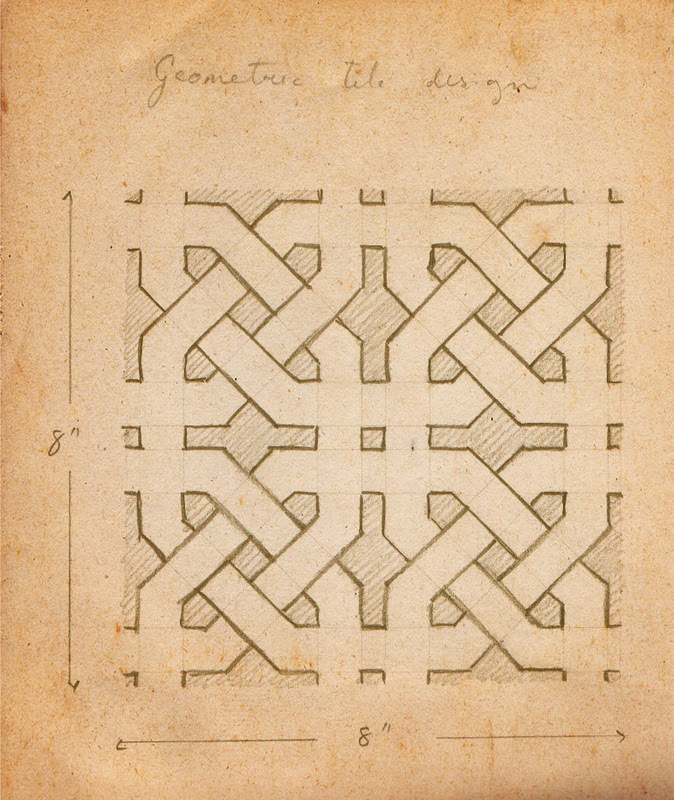 Why didn't I use this process to produce my own tile? I'm greedy and I want all the money for myself...and I needed to color the raised areas. There are a couple of ways you could create the prototype once you have your drawing laid out. 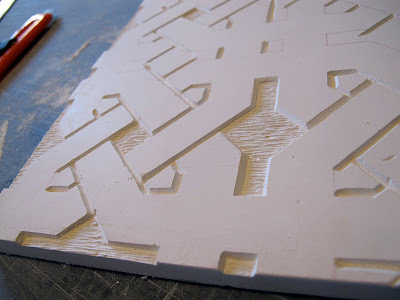 Instead of sculpting it out of wet clay, I decided it would be closer to real Sgraffito if I first created a flat Plaster of Paris tile and then scratched down through the surface to reveal my geometric design in relief. 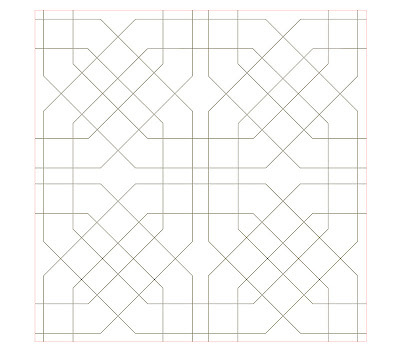 If Islamic geometry is your thing, I posted a ton of great geometric reference designs here. Fig.2: Make sure that seal is secure around the edge! I made an 8" x 8" x 1/2" Plaster of Paris tile using a frame of plastic rulers that I cut and taped/glued to my cutting board. I used the cutting board as a guide because I needed to be sure my finished tile would be perfectly square. Once my plaster tile was dry, I skimmed on a couple of coats of Kolcaustico Venetian Plaster, for a super smooth and hard surface. You could easily omit that step, though. Then I covered the back of my design with chalk then drew over the outlines, transferring it onto my plaster tile. Always make sure you 'hinge' your drawing along the top edge of the tile with tape: Lift up one corner and look to be sure you didn't miss a line. If you forgot a line or two, a hinged drawing means you don't have to worry about re-aligning it when you drop it back down on the tile. Once you have finished carving your plaster model it is time to make a rubber mold. I love Smooth-On products. They have a simple two-part system to create rubber molds that couldn't be easier to use. Their rubber comes in a huge variety of formulae for different applications, so give them a call if you're confused by the selection. I chose this product with a hardness of 30, which gave me the flexibility I needed. Next, lay your carved plaster tile back down on the cutting board. It's a good idea to seal around the base of the tile with a thin seam of caulk. This will ensure that your poured rubber doesn't bleed underneath it. 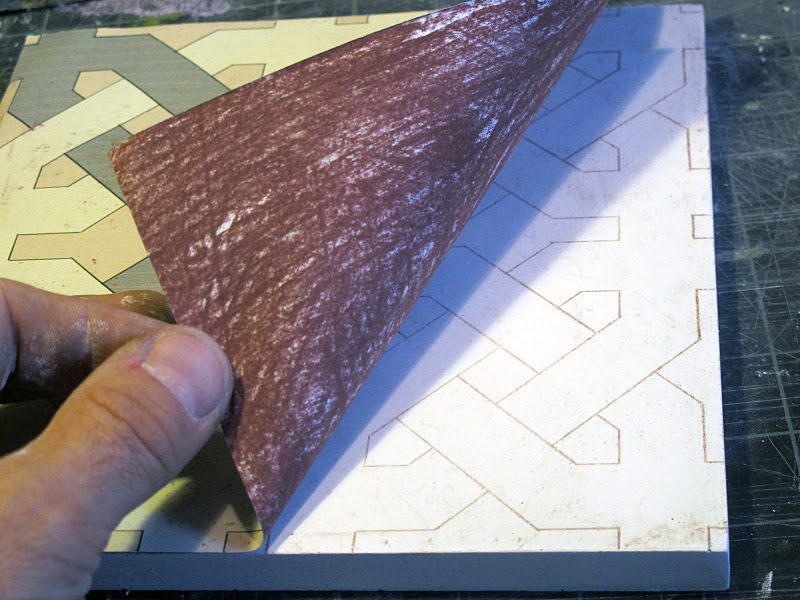 Now, make a walled frame around your tile (just as you did to make the plaster tile in Fig. 3), this time allowing an additional 1/2" space all around. 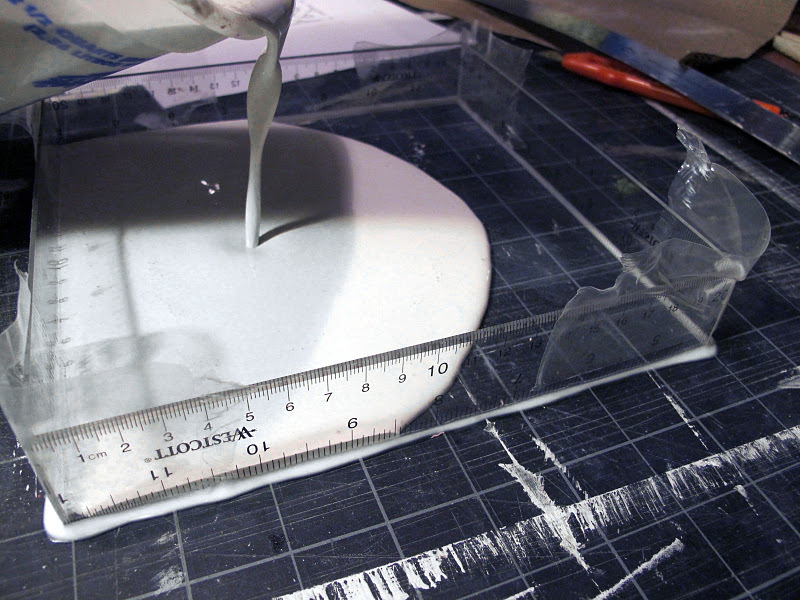 In other words, if your tile is 8" square like mine, then make a 9" square frame to pour the rubber mold. Important: Seal the edges and corners of your walled frame! The video above gives a simple demo. Paint your tile with at least two coats of Super Seal, then spray the whole set-up (including the walled sides of your frame) with Universal Mold Release. This is important to do, as Urethane rubbers have poor release properties in general, so your cured rubber mold will be really tough to peel away without it. For additional preparation at this point, Check out Smooth-On's concrete casting essentials list. Mix the rubber compound according to directions and carefully pour it into your frame to a depth of at least 1". Once the rubber has cured you can peel away your new mold. If you have done everything correctly, you will have an exact copy of your original and can making many castings with your rubber mold. Any more questions? Smooth-On has a free PDF doc called How To: Make Molds and Castings. Concrete Decor magazine is a fantastic resource for Industry and Artists alike. It's full of great information, videos, links and products. Be sure to dig around on their site before you get going: Concrete is a complicated process. I tinted my concrete using powdered concrete pigments (Fig.6/2 above). You must mix these into your dry mix before you add water (Fig.6/1). What kind of concrete you use depends upon the application. The first time I tried to make a concrete tile I used so much aggregate that my thin tile just crumbled in my hand. My tile will not be walked on - it's for an exterior wall - so I figured I'd use Cement-All which dries really quickly, is good for casting, and has very low aggregate so dries smooth. 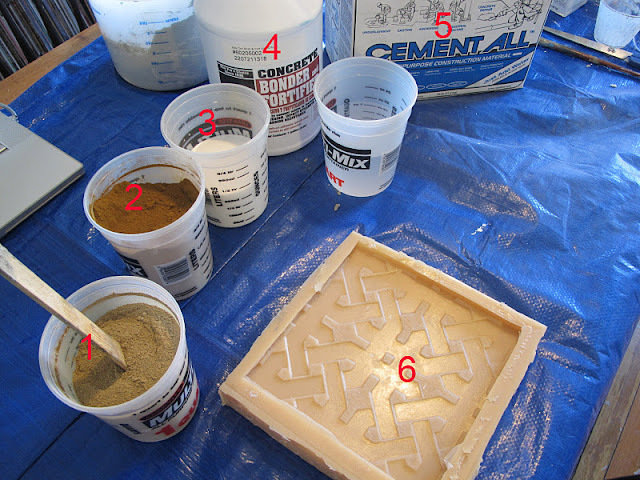 Remember to spray a coat of Universal Mold Release to the rubber mold before you fill it with your concrete mix (and each time you make a new copy), and make sure that your mold is on a perfectly flat surface. I painted the raised elements of the design to match a carpet swatch sent by my client. Sgraffito walls are scratched down through a glaze layer revealing a different color underneath, so painting on the raised surface of your tile is not a bad idea. There is a fair amount of debate as to what kind of paint you can and cannot use for painting on concrete, so I'm not going to make a specific recommendation but just say that you might want to read up before you tackle this part. There are plenty of free online resources that will guide you. Consider sealing your tile for longevity, depending upon it's application. Will it be inside or outside? Will there be heavy traffic on it? I was concerned about the sheen of the sealant (anywhere from Satin to Gloss), and also that it would change the colors of my tile, so I didn't use any this time. Check this site out for some sealant considerations. Oh, I almost forgot; here's the geometric drawing I made... have fun! Are you serious? What can't you do there, Alf? My god, this is the coolest thing, ever. Thank you for sharing all your wealth of knowledge, my good ol' Brooklyn pal! We're going to have to talk about this one...it's way out of my realm of knowledge. You are the man! Cheers! Thanks too for the shout out. If they go for it, please be sure to share a nice finished shot of the installation. You sure keep finding interesting gigs! ... and your blogging effort continues to amaze and inspire. Thank you so much for your blog and the generosity with which you share your knowledge. 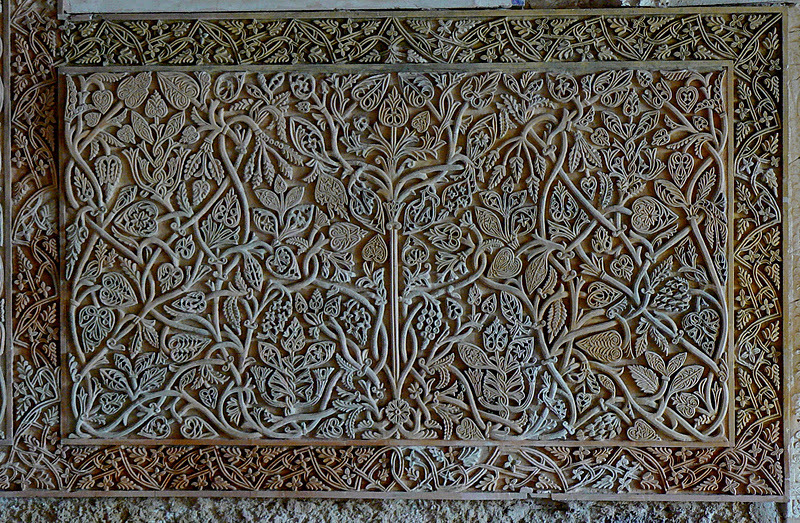 Can I ask how you keep the depth of carving even? I can't imagine making a lot of tiles but I would like to try this to make a gift for someone. DD; I wondered how I was going to do that myself, but it wasn't even an issue when I started carving. I just eyeballed it. I guess you could wrap a piece of blue tape all around the sides of the plaster tile, the top edge of which comes down 1/8" from the top of the tile. You could then just carve down no deeper than the tape. Alan's solution takes care of the edges. For the center section an easy depth gauge (sp?) is to slice a layer off a pink pearl eraser and run a section of stiff wire (like a coat hanger) through the eraser. You can push eraser to register at the correct depth with the wire at the bottom of any cut. It's quick and works well. What a fantastic post -- thank you, Alan. Can't wait to really dig in and try this out. 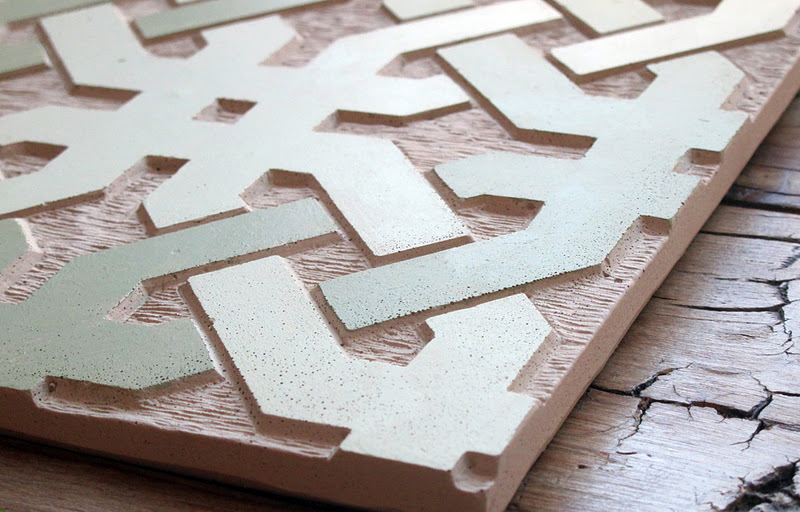 I recreated a few tiles years ago for a client using rubber molds we created but this seems a level up, which is very exciting. Thank you, Alan, for such an informative posting - there's so much to take in here, and you've introduced me to new products and loads of new ideas. And I have to add, your eyeballing is pretty darn amazing! Thank you for sharing your post. I really enjoyed reading it.. I think rapid prototype method with using tooling practice to produce a mold parts of functional model from CAD data in less time & at a lower cost. The locales you have alluded was great. Much obliged for sharing..